Mkts rebound with eye on F&O expiry. After declining about 1 per cent at opening trade, the markets have managed a smart recovery on Wednesday ahead of expiry of September derivative contracts and positive European cues. Mumbai: After declining about 1 per cent at opening trade, the markets have managed a smart recovery on Wednesday ahead of expiry of September derivative contracts and positive European cues. Meanwhile, the investors are waiting for the expiry of the September F&O series and roll over positions to the October series due on Thursday. 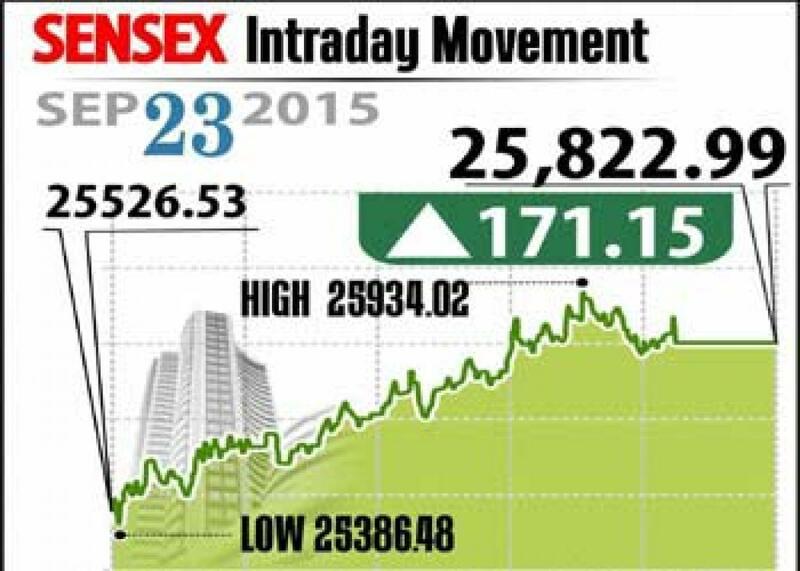 Sensex closed 171 points higher at 25,823, while Nifty gained 34 points to end at 7,846. The broader markets also gained with midcap and smallcap index up between 0.5 to 0.7 per cent. However, analysts say that range bound trade to continue for some more time however there are lot of opportunities for investment after the recent correction. Accordingly, the Nifty may stay between 7,500 and 8,100. On the sectoral front, all the sectors gained at closing with bankex, healthcare, IT, FMCG, Consumer Durables, Oil & Gas and Realty indices closed between 0.5 to 1.5 per cent. While FMCG major ITC ended at 1.7 per cent higher, IT giants TCS and Infosys up 0.5 per cent and 1 per cent each. Further bank, relaty and select auto stocks also gained with favourable macro economic data and advancement in monsoons. With the rate cut hopes, Axis Bank, ICICI Bank, HDFC Bank, HDFC and SBI gained up to 2.7 per cent, while auto stocks like Maruti and Hero Motocorp ended higher up to 3 per cent. Heavywights like L&T gained about 1 per cent, on the other hand, BHEL lost 1.6 per cent on rating downgrade. The gainers: Lupin, up 2.83 per cent at Rs 1,921.30; Vedanta, up 2.71 per cent at Rs 94.85; HDFC Bank, up 2.17 per cent at Rs 1,049.95; Mahindra and Mahindra (M&M), up 2.10 per cent at Rs 1,211.75; and ITC, up 1.28 per cent at Rs 316.05. The losers: Tata Motors, down 1.73 per cent at Rs 310.20; Bharti Airtel, down 1.49 per cent at Rs 338.10; BHEL, down 1.24 per cent at Rs 199.15; GAIL, down 0.86 per cent at Rs 287.25; and Bajaj Auto, down 0.79 per cent at Rs 2,240.25.